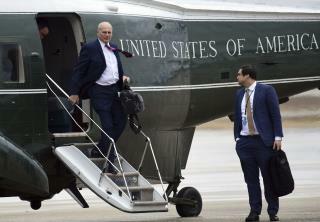 (Newser) – Under pressure over his handling of abuse allegations against a top aide, White House chief of staff John Kelly on Friday ordered sweeping changes in how the White House clears staff members to gain access to classified information, acknowledging that the administration "must do better" in how it handles security clearances, the AP reports. Kelly issued a memo that acknowledged White House mistakes but also put the onus on the FBI and Justice Department to provide more timely updates on background investigations, asking that any significant derogatory information about staffers be quickly flagged to the White House counsel's office. The issue has been in the spotlight after it was revealed that former staff secretary Rob Porter had an interim security clearance that allowed him access to classified material despite allegations of domestic violence. The memo said the FBI and Justice Department had offered increased cooperation and, going forward, all background investigations of top officers "should be flagged for the FBI at the outset and then hand-delivered to the White House Counsel personally upon completion." Dozens of White House aides have been working under interim clearances for months, raising questions about the administration's handling of the issue and whether classified information has been jeopardized. Kelly's plan would limit interim clearances to 180 days, with an option to extend them another 90 days if background checks had not turned up significant troubling information. The memo also recommends that all Top Secret and SCI (Sensitive Compartmented Information) clearances that have been pending since last June be discontinued in a week. I've never heard of any other administration having so many problems with security clearances. Probably because other administrations didn't nominate horribly unqualified, low-life, career criminals to positions of importance! They've been doing this crap for 50 years and can't get it right? sheessshhh. Horse already left the barn,Kelly.